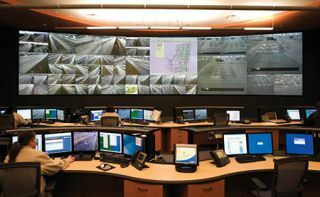 Florida’s Department of Transportation (FDOT) VNOC was integrated by AVI-SPL. Remote monitoring and management of videoconferencing network operations centers and other AV installations, delivered in the form of Software-as-a-Service (SaaS) or Monitoring-as-a-Service (MaaS), offer benefits to both vendors and customers. But with data breaches at businesses and governmental agencies being reported with alarming frequency, just how secure are these cloud-based services? For AV integrators and other solutions providers, these services provide a revenue center and a way to establish deep and long-lasting customer relationships. For the end user, they potentially relieve stress on in-house IT resources and reduce hardware and software costs through outsourcing. “Every medium to large integrator I’ve talked to sells managed services,” commented Daniel Jackson, senior research and development engineer at Crestron Electronics. “They don’t make money on the products the way they used to; they make money selling service contracts. Integrators have been using off-the-shelf remote monitoring and management tools such as the Tandberg Management Suite (TMS), Extron GlobalViewer Enterprise (GVE), Crestron Fusion, and others, for some time. But as computing shifts to the cloud, “You don’t have to reinvent the wheel; we already have a cloud product,” said Scott Allard, co-founder and managing partner of AVNOC, which offers HIPAA-compliant remote monitoring, help desk, and service center applications. Integrators can create a high-security environment for their customers in the cloud that doesn’t have to be hosted by Amazon Web Services or use a virtual private network. “We can put it right in your network, our cloud, their cloud; they can put it in the customer’s network, and it can be their cloud. The days of open VPNs are long gone,” said Allard. There are various ways to ensure security at that scale, starting with physical security. Companies such as Amazon comply with ISO/IEC 27001:2013, a group of standards for information management security systems, which restricts physical access to the equipment, for example. “Then, how do you partition the data, where is it backed up, where does it reside? That’s where it gets fluid in terms of the type of application, the type of code, where and how it’s being hosted, how you partition,” Laezza continued. Some remote management providers combine one or more solutions from different developers while others offer a more unified approach. But aggregating solutions can be a challenge. “Your support models and client interfaces are different. It ends up being an interesting mix for some enterprise clients,” said Marquis. Jackson also noted that Crestron Fusion Cloud Edition is now available. “It’s a private cloud option,” he said.